Stainless steel and metal chopsticks will last almost indefinitely, and will stand up to heavy use and washing. Popular are the metal Korean-style chopsticks with their unique, flat profile. While very similar to the shape of silverware handles in Western cultures, many people find getting used to Korean style chopsticks a little challenging. Korean Spoon and Stainless Steel Chopsticks Set with etched floral pattern. 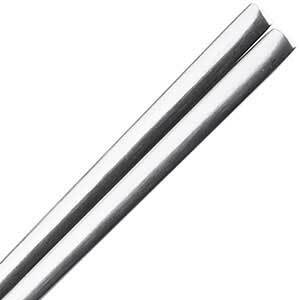 Polished stainless steel everyday-use chopsticks. Classic Korean chopstick shape - flat like silverware - these stainless steel chopsticks are 9 inches long and 1/16 inch thick. Made in Korea. Korean Spoon and Stainless Steel Chopsticks Set. Polished stainless steel everyday-use chopsticks. Classic Korean chopstick shape - flat like silverware - these chopsticks are 9 inches long and 1/16 inch thick. Made in Korea. Korean spoon and stainless steel chopsticks set with etched square pattern. Polished stainless steel everyday-use chopsticks. Classic Korean chopstick shape - flat like silverware - these chopsticks are 9 inches long and 1/16 inch thick. Made in Korea. 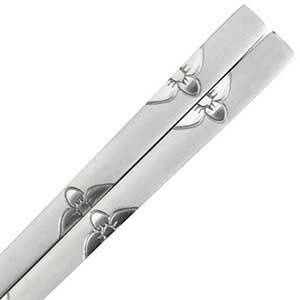 Korean style stainless steel chopsticks with brushed flowers design. Polished and brushed finished handle. Classic Korean shape - flat like silverware. These brushed flower chopsticks are 9 inches long and 1/16 inch thick. Made in China. Korean style stainless steel chopsticks. Polished finish. Classic Korean shape - flat like silverware. These Korean metal chopsticks are 9 inches long and 1/16 inch thick. Made in China. 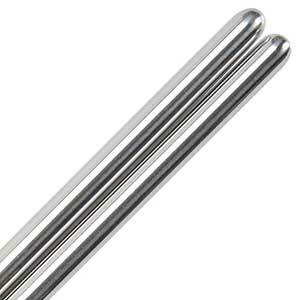 Polished stainless steel dishwasher safe chopsticks. 9 inches long tapered shape. Grooved tips for easy gripping of food. Dishwasher safe and very durable. Like using metal stainless steel silverware. Surprisingly lightweight. Round profile. These metal chopsticks are made in China. 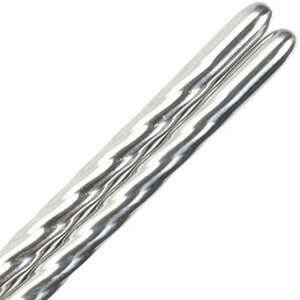 Polished stainless steel elegant chopsticks with twisted handle design. 9 inches long tapered shape. Grooved tips for easy gripping of food. Dishwasher safe and very durable. Like using metal silverware. Surprisingly lightweight. Round profile. These metal dishwasher safe chopsticks are made in China.